I'm starting in on the work day as the kids go off to their last day of school. Emma survived her finals and has some new classes next term - Earth and Space Science, Child Development, and a few others. Duncan's new class is Robotics. I had a nice coffee with mom yesterday. My heart calcium test returned - I'm just fine as I suspected. Joanna gave notice at her office and is thinking through her business' next steps. Work is coming along nicely - I passed one of the two certifications for the first time, though admittedly it was just a test run and the easier of the two. I've got to get ready for my trip this weekend. There are also endless Christmas decorations to put up. Duncan and Benny are hanging out with their dad over this weekend, which hopefully goes well. I'm hoping for some library runs and hang out time. It's not quite Mocha Friday, though I'm heading out for coffee with mom this morning. It's been a pretty quiet week. I took dad's car to the car lot to be sold, freeing up some driveway space. We had the leak in the roof looked at, and we'll hopefully get the roof vents replaced soon. The main floor toilet and upstairs shower knobs were replaced. Joanna's been doing a good job maintaining our lovely and historic home. Work is chugging along - I'm trying not to get too attached on whether or not we'll actually make our deadlines. I snuck in some work on my old project as I wait for data for my new one. Jamie's on vacation this weekend so Emma's hanging out with us for the next few days as she finishes up the term. Kevin is in town, so Duncan and Benny were likely spending a fair amount of time with them. I'm hoping Joanna and I can have some hang out time, as our date night was thwarted last night. I've returned to work after my week off. I kinda remember how to type on the keyboard and make things happen. I've got a full week, then I'm off to Salt Lake City again next week. Sam and mom made it back home, both seeming pretty wiped out. Joanna and I had our kissaversary yesterday, where I gave her a book I made from scratch, complete with pictures of us together. I think I scored bonus husband points for that one. We took Emma, Duncan, and Benny off on a hike through brambles and mud around Moon Mountain. I've been trying to explore new places more often these days. Sam is officially 20 today, dropping us down to two teenagers in the house. It's funny to think that two decades ago everyone was hanging out in the hospital waiting room, eating turkey and waiting for Sam to be born. My week off work is coming to a close. Thanksgiving was a small, but pleasant affair. Joanna cooked up a storm, feeding Jenny and her family, along with Bob who seemed in good spirits. We ate and chatted until people had to go to their next event. Joanna went for a walk and visited friends. Emma and I continued our Lord of the Rings marathon and finished the Two Towers. I think Gimli has grown on her. Today has been pretty low key. Joanna tried to do her normal exercise and work routine. I fed kids breakfast and generally moved them through the day's routine, getting them doing homework as much as I could manage. 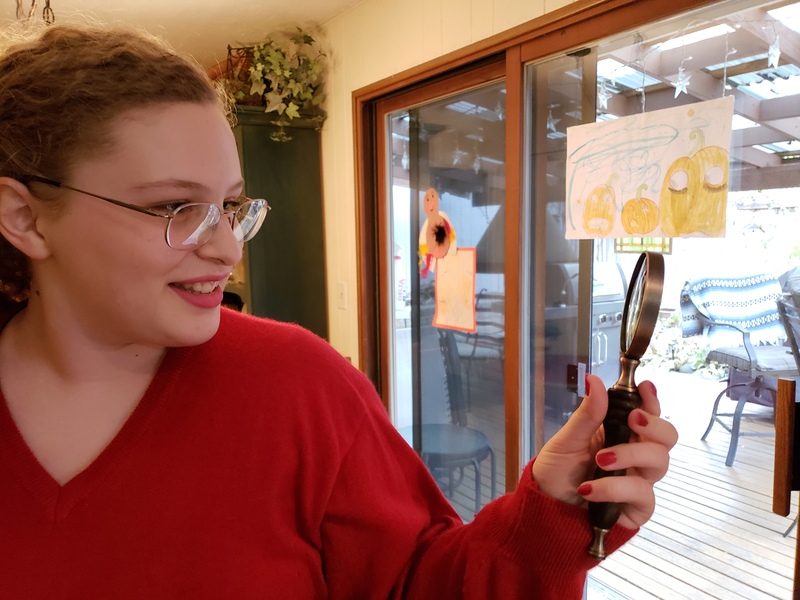 Finals are next week for Emma, so she has her final art project and various tests to study for. She's getting all A's, but her AP US History grade is a little on the low side. We have a leak right over the living room table, likely due to some issue with the roof and the recent storm. Hopefully it's an easy fix. Tomorrow I go in for a calcium test for my heart, as my doctor wants to decide if I should go on statins or not. Such is the result of higher than normal cholesterol scores at my advanced age. Hopefully it's fine and I can do nothing. Sam and mom are in Utah, heading back from Thanksgiving with Seraph and family. I think they both had a good time. Sam reports really enjoying the landscape. As his longest driving before now was just an hour, this should be quite a bit of experience doing road trips. 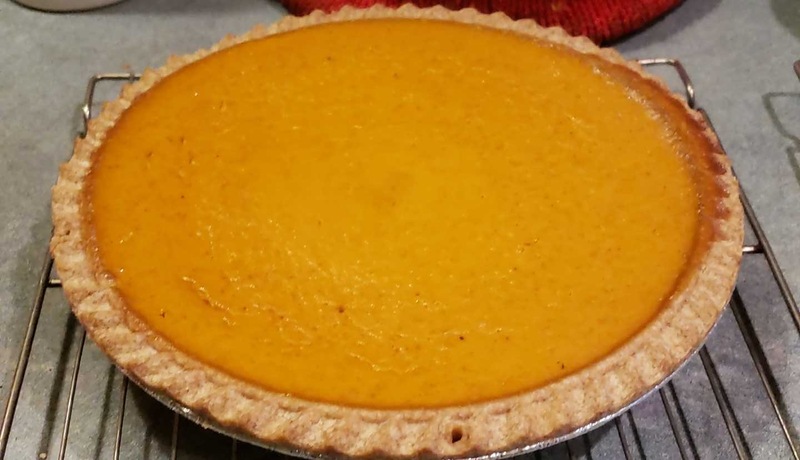 I made a pie today. And played way too much Hollow Knight. But the pie made it a productive day. I've been doing a mix of house projects and video games the last couple days I've had off work. The weekend was hanging out with Emma, watching yet more Lord of the Rings, and having her drive to her mom's house for the first time. Duncan, Ben, Joanna, and I went for a hike on Ridgeline Trail late Sunday - it was good to get the stick blowed off us. Both Joanna and I were feeling under the weather, though I'm starting to feel pretty good again. In terms of house projects, it's been nice to accomplish all the little things I never have time for. I changed the bulb in the driveway light. I cleaned out the basement closet, producing three big tubs of electronics to donate. I went through all the nerd stuff that accumulated from a year's worth of Loot Crate and got it ready to give to Jordan. Hopefully he enjoys it. But I made pie, so it's all okay. I'm working away at my morning mocha. It's a short day for me - the Salt Lake City office shuts down and they're all going to the latest Harry Potter movie. I could theoretically take anyone who wants to the movie, but enthusiasm seems to be low. Maybe I'll go play cards with Emma in a coffee shop or something, as she gets out of school early too. Next week I'm off work entirely, which will likely be a mix of house projects, video games, and hiking with Joanna. Should be pleasant. 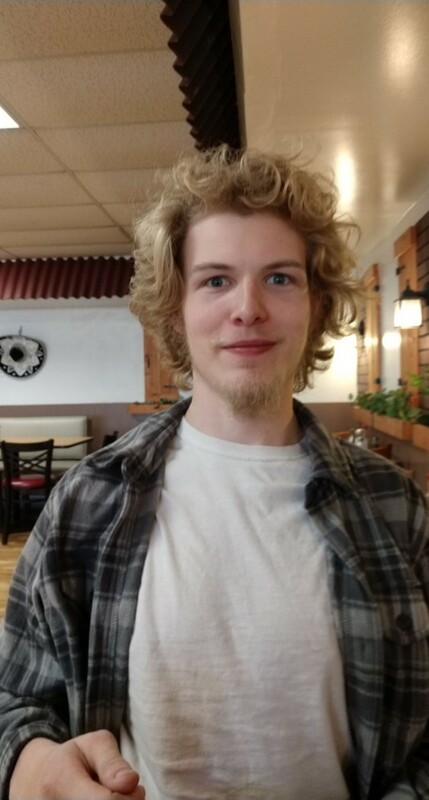 I talked to Sam last night. He and mom and driving back after Thanksgiving. Sam also accidentally dropped a pipe on his little toe, which he wasn't sure was broken - he may just tape it and do the usual ice/Ibuprophen route. Otherwise he seems to be having a good time hanging out with Seraph and Isa and all. He sleeps in a bed with assorted cats and dogs. The door to the bathroom next to him apparently stops at his neck. Apparently the houses they build a hundred years ago were all hobbit houses. Ben and Emma were both working on homework until very late last night. Joanna had a touch of a headache and I woke up at two with one as well and grabbed some Advil. A week off work sounds lovely. It's been a pretty quiet Veteran's Day. 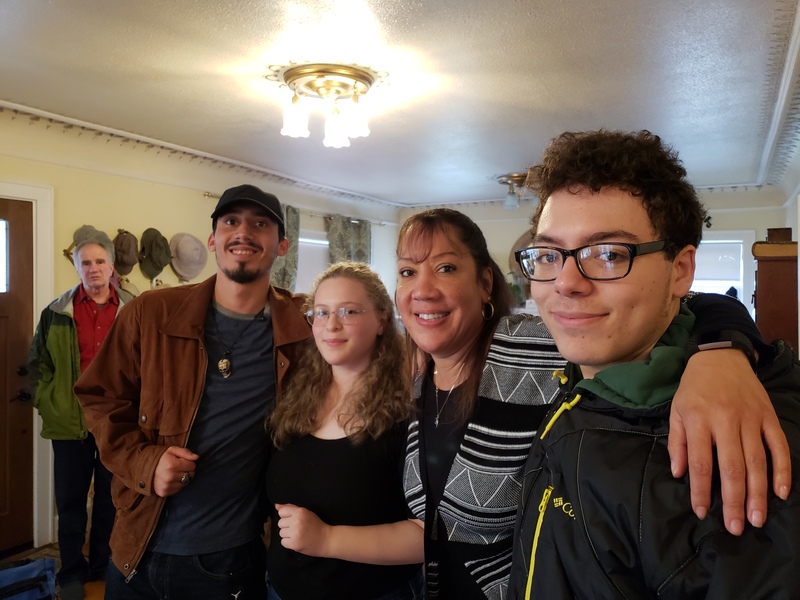 Sam and mom arrived in New Mexico last night, thankfully pushing hard to make it in two days as they just barely got there before the snow hit. The weekend was filled with miscellaneous odds and ends. Benny and I painted some trim in the hallway, with plenty more to do. Benny, Duncan, and Joanna went to the Eugene Comicon and saw a Star Trek play with one of Benny's friends. I cut down an old maple tree that wasn't getting enough light and we planted a new one on the edge of our property. Emma and I took a long walk through the lovely fall weather. Joanna went to the gym and met with a fitness instructor on what she can do while still being careful of her back. We did have a fun exploration of a new park - the South Eugene Meadows. It was a semi-developed large meadow with lots of oak trees. Benny and I wandered off and came across some rough terrain. Joanna and Duncan took a more typical path. A four day week awaits us, and then I have the next week off. My house project list is already growing. We'll see how much I actually manage. It's another mocha Friday, the kids are off school and I have Monday off. Sam leaves for New Mexico with mom on their grand road trip. Hopefully it all goes well - I'm trying not to fret. Sam and I are going to see Overlord in the theaters this afternoon, which I hear is good. Tomorrow I'm feeding him an early breakfast and sending him off with a thermos of coffee. Emma's hanging out in my office, entertaining me with southern accents. She asked me what I was working on and after I responded she replied, "Whatever, city boy." It cracked me up. The younger kids are being lazy. Joanna is going to the gym, then off to look at possible new offices. The weekend is likely going to be pretty quiet. 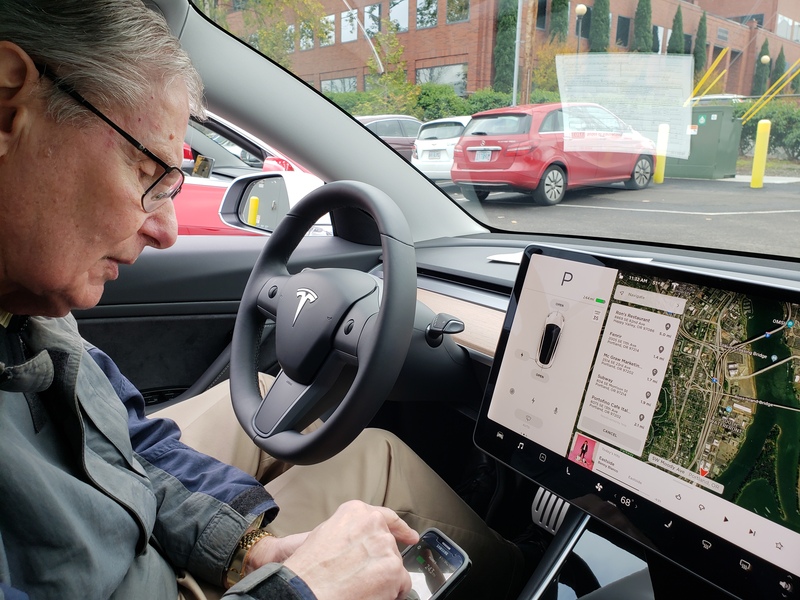 Dad and I drove up to the Tesla dealership in Portland to pick up his Model 3. It was a fun roadtrip, and dad entertained me with his usual chatty banter as we headed up I-5 in the morning fog. The Tesla dealership was tucked away in a quirky location down a steep hill and across railroad tracks, but the garage was clean and painted with bold white and red colors. Eventually we handed over the check, got our key, and headed out to the car. It took a few trys to figure out how to pair the phone with the car and where to press the key against the side of the car (below the camera, of course). The interior was a minimalist's dream, with no dashboard controls and just a touchscreen monitor, a few buttons on the wheel, and turn signals as a nod to tradition. We eventually figured out how to open the glovebox, play music from his phone, and how to switch driving mode from Performance to Chill (dad opted to keep it at Performance). 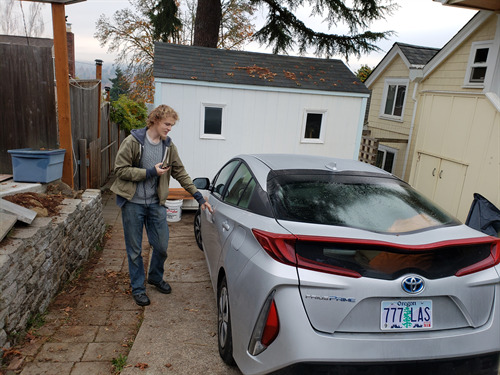 Soon we were off to lunch, carefully driving through Portland construction until we had a pizza and chatted a little more before returning to the dealership to pick up my car and part ways. It was a generally good, happy chaos sort of weekend. Emma came over Saturday and we did our usual mix of homework, driving around the neighborhood, and pizza and Mythbusters. The post-dinner rap battles and drawn inventions were pretty amusing. Sunday I gathered everyone up for a hike in the woods, this undeveloped place next to LCC. We wandered past the clear cuts and cougar tracks, split up to cover more ground, and didn't get eaten before we returned for lunch and a lazy afternoon. Sam and I played more EU4, conquering the world together. Emma and I played Room II and some throwback Peggle levels. Everyone is generally doing well. Sam and mom may do a road trip to see Seraph, returning after Thanksgiving. It depends whether or not he gets this job he applied for, and if he gets it whether he can take some time off. Roadtrips with grandmas sound relatively safe and would make a good band name. I had an epiphany at work yesterday and my death march project started making sense. I think there's a chance I'll get my piece done, though other people are working on some very hard problems. The deadline is looming and I still don't think we'll succeed, but at least I'm enjoying doing what I'm working on a little more. Wednesday I drive to Portland with dad to pick up his shiny new Tesla. I've got a Salt Lake City trip at the start of December. Sam turns 20 in a few weeks, and Christmas is looming on the horizon. I've got the week off Thanksgiving, which I'm hoping I can use to play through some of my video game backlog, mixed with enough house projects so Joanna doesn't look at me askew. The kids are slowly getting ready for school. My espresso machine is prepped and ready to make myself a mocha. Joanna is still in bed, enjoying a brief respite before the day begins. Life's generally okay. My work project is fine once I let go of the outcome. We hit some obstacles getting a server yesterday - I think we should roll up our sleeves and do it ourselves. I think my development piece is nearly done - pretty soon I'll need to figure out what else I can do to help, or go back to my old project for awhile. I'm looking forward to the weekend. I picked up some new VR games that we're trying out. The scary one is pretty scary, but Sam talked me into getting it. Halloween has come and gone. I drove over to see Emma at her mom's house. She was dressed up as Nancy Drew - apparently few people dressed up, but her outfit looks like something she'd wear normally. 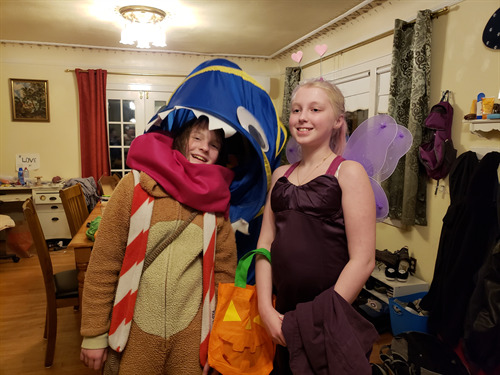 Duncan dressed up as his Geometry Dash character and Benny dressed as a giant worm. When they were kids, I'd stick on this giant blue tube and chase them around. Joanna added eyes, teeth, and a tongue glove for Benny to grab candy with. It worked out well. The younger kids went off with friends, while Joanna knitted on the couch and passed out candy. I watched Sam play some of the new VR games I got in the latest Steam sale. One was this creepy game inspired by Silent Hill. I started calling Sam "The Plumber" since he looked in every toilet after finding ammo in one once. I've got some other VR games I haven't had a chance to play yet, but I wanted to stock up a little for my week off of work later in the month. I'm off to have coffee with mom later this morning - we'll likely go over her will or something equally fun. Work is pretty free-form today - people are doing presentations on various topics and we jump around listening to people talk about things. My work project strangely became fun, despite my assessment that we're unlikely to be successful. It still might end up being useful work, and I might as well enjoy the ride.